This video shows you the mechanism for the formation of Nitronium – the super electrophile that is attacked by benzene in the nitration reaction. This video also helps you understand the role of the acid catalyst before and during the reaction. 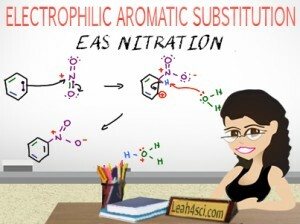 This is Video 4 in the Electrophilic Aromatic Substitution Video Series. Click HERE for the entire series.